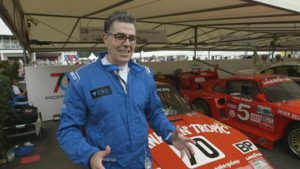 Adam’s new streaming show, Adam Carolla Goes Racing, is self-defining, and designed with your digital-age attention span in mind. For those of us who cannot get enough of the Ace Man or autoracing — or the Ace Man jonsing on auto racing — both Motor Trend and Vero speed to our rescue. Motor Trend magazine has a channel, and the channel has Adam. Vero, the social media network that celebrates artists without algorithms, ads, or bots, also offers the series. Join Adam as he ventures to England’s Goodwood Festival of Speed, interviews famous racers like the WWE’s Bill Goldberg, and races Paul Newman’s LeMans-winning Porsche 935. More eps to come! The Motor Trend channel offers an overdose of automotive shows as well as news on the latest automotive research. There’s a 24/7 free service that features top-rated series like Roadkill, Dirt Every Day, HOT ROD Garage, Head 2 Head, Fast and Loud, and Wheeler Dealers. A subscription service gives you thousands of hours of extra videos and it’sad-free. No cable needed. Adam Meets The Porsche 935: It’s the first day of the Goodwood Festival of Speed – one of the largest automotive events in the entire world. Adam travels across the pond from sunny Southern California to race Paul Newman’s Le Mans-winning Porsche 935 in the Woodstock of cars. Will the comedian ace the first run – or will he burn out on the flint wall? Nick Mason’s Ferrari GTO: Adam interviews the driver of Nick Mason’s 1961 Ferrari GTO. The car was purchased for about $75,000 and is now worth $60-70 million. Adam goes through the car and what it’s like to drive such a pricey piece of machinery. Bill Goldberg Crashes His Florence Capital Toyota: WWE’s Bill Goldberg shows up at the Goodwood Festival of Speed and races a NASCAR truck. Things are going well for Goldberg … until they are not. The 2018 Hammer Bonhams Auction: Everyone wants to see super expensive cars at auctions and find out how much they sell for! Adam and Matt D’Andria hit the Bonham’s auction at Goodwood and show us a 1967 Aston Martin, a 1962 Mercedes and a 2003 Ferrari. Watch and bid along with Matt and Adam to see if you can guess the hammer price. Battery Trouble – Race Day 2: Adam prepares for his last race at the Goodwood Festival of Speed. But the battery in his legendary Porsche, which Paul Newman drove to win Le Mans, has suddenly gone dead. And his team didn’t bring a spare. Will Adam get his car to the race on time, or will he have to sit out his last run? You can binge it all on Motor Trend and Vero. Still not enough? We completely understand. Try Chassy’s selection of automotive and racing documentaries. ADRENALIN – the first feature-length documentary about the touring car history of BMW. The film looks back on 50 years of touring car racing with the Bavarian brand, in depth with never before seen footage. The story begins in the 60s, where the cars have been prepared on the hayfield and the drivers were sliding over the Nürburgring or the Eau Rouge in Spa until the flies were sticking on the side windows of their cars. The founding of the M GmbH in the beginning of the 70s. The M1 with the legendary ProCar races during the Grand Prix weekends. The success story of the M3. And the glory days of the DTM with wheel to wheel racing at its best. ADRENALIN lets you relive the history. Alex Zanardi’s miracle victories in the World Touring Car Championship after his terrible accident, where he lost his legs. BMW’s sensational comeback into DTM with that unexpected win of the championship title. The film illustrates BMW’s touring car highlights from five decades with stars and strategists narrating from the cockpit’s perspective. From Hubert Hahne and Striezel Stuck to Bruno Spengler. From Jochen Neerpasch and Charly Lamm to Jens Marquardt. 24 Hours: One Team, One Target: The 24-hour Race at the Nürburgring is known as the world’s biggest motorsports event. More than 200,000 fans set up their camp in the Eifel forest and cheer for their heroes in the 210 race cars. Lap after lap. Hour after hour. Day and night. It’s the stage for great stories. Sorrow and joy. Excitement and exertion. Drama and emotions. You will hardly find any event that brings the extremes this close together. In the thick of things, the two cars of last year’s winner BMW with their 70 team members. For months, engineers, mechanics and, of course, the eight pilots have been preparing for the most important race of the year. The filmmakers Tim and Nick Hahne captured it all with their cameras – from the first test drive to the chequered flag coming down – and accompanied the BMW team on the way to achieving its goal: winning the 24-hour Race. Click here to discover more racing and auto docs!